This blog post was created in cooperation with Mike Rink – Product Evangelist at Comalatech. We will show you a better way to update your public content discreetly preventing anonymous users from viewing your drafts and internal discussions. Atlassian Confluence is a team collaboration platform that helps you create, share, and keep your information in one place. Teams who choose it discover improvements to internal communication, document management, and project development processes. But Confluence is more than a document repository. A number of companies have found Confluence to be an extremely effective tool for knowledge sharing, specifically as an extranet site for public documentation. 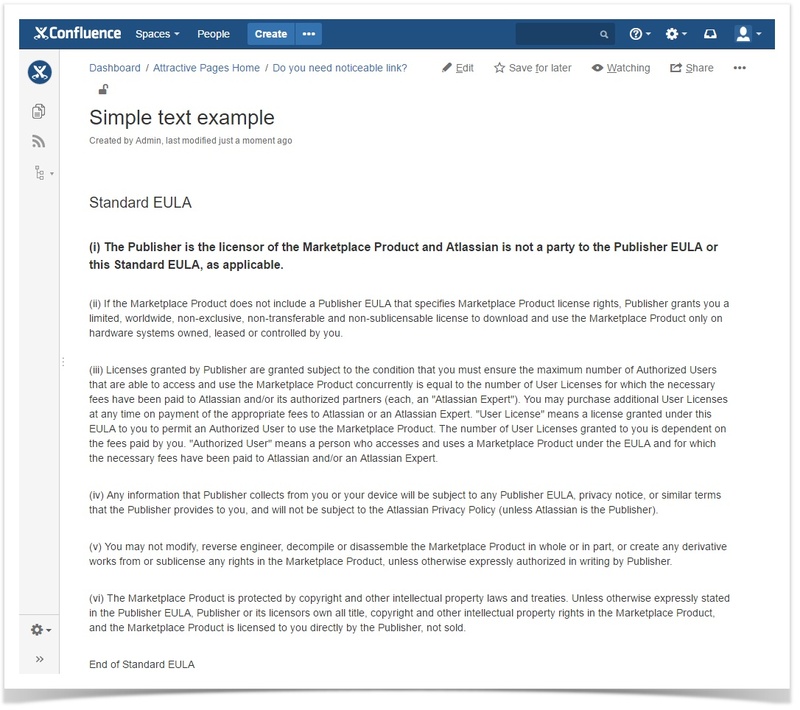 Many Atlassian Vendors use Confluence as a product documentation portal to share essential information about their apps with their current and potential customers. For companies that need to communicate internally, Confluence can be configured as an intranet site to share information with teammates who don’t have an account in Confluence. In this case only members of your corporate network can access your Confluence site, but the information is still shared with stakeholders. 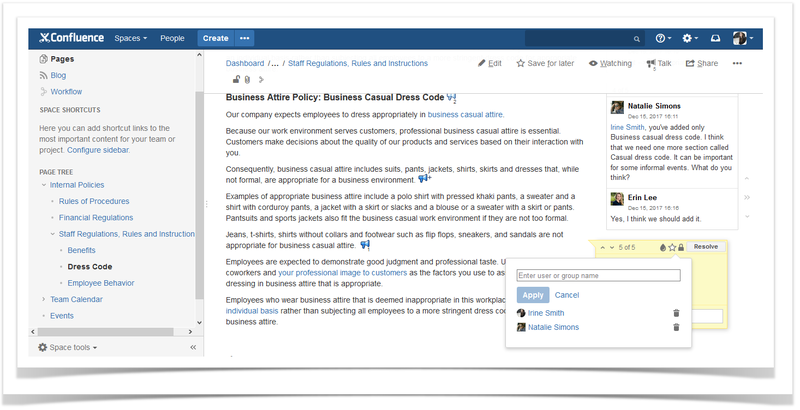 It can be a great solution for large companies where only certain departments can log in to Confluence and other employees have read-only access to Confluence spaces. Whether working on public content using Confluence as an extranet or an intranet site, both have one thing in common: the number of content editors is smaller than the number of information users. 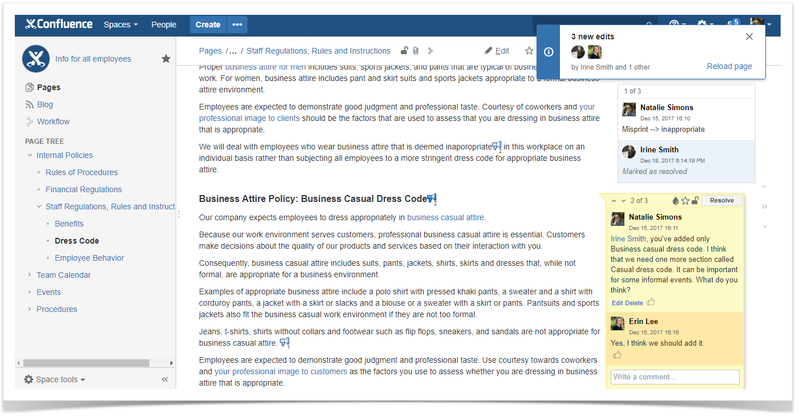 The editors may encounter difficulty in updating the content discreetly because any change they make or any inline comment they add to the public content in Confluence will be visible for anonymous users. In this blog post, you will discover how two apps, Comala Workflows and Talk – Advanced Inline Comments, help teams to update public content internally, preventing anonymous users from viewing drafts and internal discussions. Consider a common case when HR departments produce Confluence content, and other employees in the company have read-only access to the information the HR team shares. In the example below, the public space is called “Info for all employees”. This means that everybody in the company can view any page in this space. In this case the management team asked the HR department to edit the Staff Regulations, Rules, and Instructions page. They need to describe their company’s new dress code policy, add information about the benefits the company offers, and explain what the term ’employee behavior’ means for their company. The editors have a lot of things to discuss in private while writing. Unfortunately, the native comments in Confluence have no viewing restrictions. Moreover, any update made to the content will be immediately visible to the employees. So what is the best way to prevent the employees from viewing the drafts and internal discussions? Imagine that the HR team doesn’t use any Confluence apps. In this case they will need to keep all drafts either in a separate space with viewing restrictions or use a separate Confluence instance. Otherwise all the changes made to the content are visible to everybody. When they are ready to publish this page, they will need to copy and paste it, or move it from this space to the public one. If they copy the content from another Confluence instance, they will spend even more time and effort. Especially when the document contains pictures, because they will need to insert them manually in the public page. The HR team needs to add three new separate documents. This means that they will repeat the process with moving their content to the public space at least three times, tripling the effort required. Another problem is that they can’t discuss the content discreetly in the public space. They need to resolve all comments before they move the page to the public space because Confluence native inline comments have no viewing restrictions. The editors can add and resolve comments only in the view mode. As you can see, this process is time-consuming and bit tiresome if the team doesn’t use any apps. The good news is that there is a better way to fulfill this task. We will show you how to work on the documents right in the public space using Comala Workflows and Talk – Advanced Inline Comments. 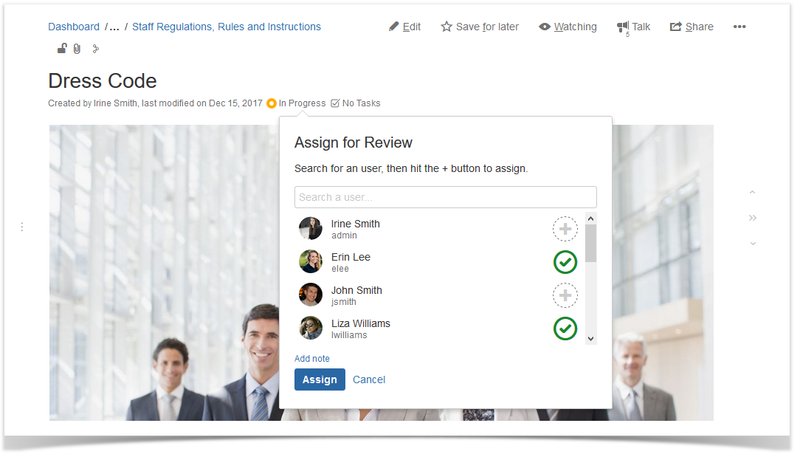 This useful solution from Comalatech helps the HR team ensure the content shared is approved, while allowing users from other teams to see the last approved version of the page. They start by applying a workflow to a page. Next they assign team members to review, approve, and publish pages. When the status of the page is ‘In progress’, the content is available only to the editors. They can add tasks for their colleagues. Users that can not edit the page will not see the content until it’s been approved and published. Editors can confidently edit documents, because users outside the editing team will always see the last approved version of the page. This app allows the HR team to track all the updates of the page. This way the Comala Workflows app simplifies the whole process. Now the editors can manage three new pages in the public space. This powerful tool from StiltSoft helps users add inline comments (talks) that have a wider set of capabilities than the native inline comments in Confluence. Now the HR team can set default space viewing permissions applied to all the talks created within the space. They can add either the whole group of users or certain users. With the help of this feature any conversation of the HR team on a public page in this space becomes private. This app also allows users to restrict access to specific talks for appropriate users or groups. With Talk, the editors can add comments anywhere on the page, both while editing (not available in native inline comments) and viewing the page content. They can also add and resolve comments in both modes. They can view all available comments at the same time. Now the HR team can review three new pages simultaneously, discuss the content in real time, and collaborate more effectively. Using Comala Workflows and Talk is a great solution for collaboration between different departments of your company when one department actively works on the content of the document and other departments see the approved versions of your content. It saves time and helps you avoid mistakes when you work on public content together with your team. Comalatech and StiltSoft offer a trial period for all their products. 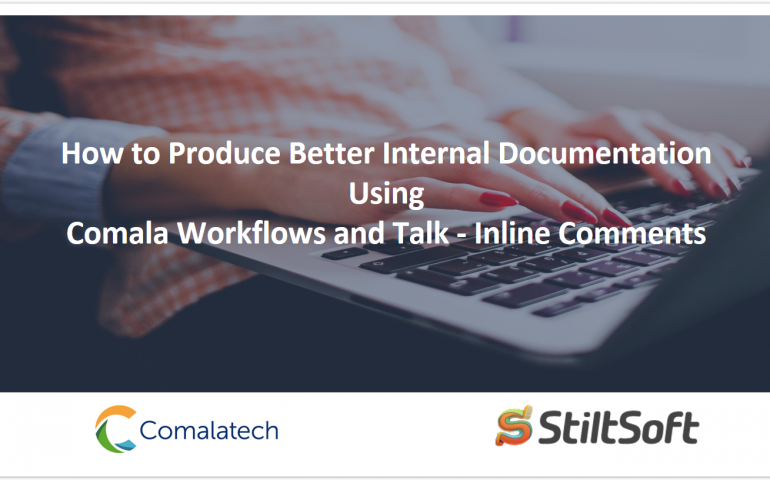 If you want to facilitate interaction between the editors of your internal documentation, you are more than welcome to try the combination of Comala Workflows and Talk – Advanced Inline Comments for free. Check back soon as we will tell you how Comala Checklists and StiltSoft Table Filter and Charts help software companies organize data better. To stay tuned, subscribe for email notifications about new posts in our blog (enter your email in the ‘Newsletter’ section on the sidebar).